I write about women being buzzed about & what women are buzzing about. Last night, the new Miss Universe was crowned. The pageant, run by Donald Trump’s organization, was live from Sao Paolo, Brazil and aired on NBC. I happen to know one of the preliminary judges, Scott Lazerson. Lazerson has been in involved with philanthropy for years, and he is also a “professional connector,” which means he pretty much knows everyone, as I wrote in my profile, What Famous Friends Are For. Miss Angola wins Miss Universe. Lazerson interviewed 89 contestants from all over the world, then helped whittle them down to ten. Pageant executives added another five girls for the telecast, and the online audience voted to add one more. Out of those 16 women, Miss Angola, 25-year-old Leila Lopes, was eventually crowned the 2011 Miss Universe. Here, Scott and I discuss how the girls advanced in the contest. What were you looking for and judging on? Now give me the real answer. Beauty, beauty, beauty. It’s all about beauty. But read their bios. Every single one of them is smart too. Well, maybe not every single one. But some really are. Miss Guam is a biochemist who wants to be a doctor. Miss Malaysia did a documentary on the United Nations High Commission for Refugees. Did either make it to the final round? Scott Lazerson (right) with producer Colin Hornett and Miss Universe 2010. 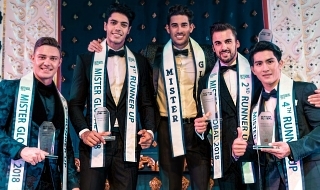 Aren’t these beauty contests a bit outdated? I think the Miss Universe pageant is relevant and fun. It unifies the world. People fly in from all over the world to watch it. The fan base is unbelievable. When Miss Venezuela came in, the roar of the crowd was amazing. She was a real fan favorite. Don’t these contests uphold women to an impossible standard of beauty and encourage young women to have issues with their weight and looks? Exactly. [For the record, winner Miss Angola says she has never had plastic surgery of any kind.] You are not going to see an A-cup winner. Do you ever see a plus-size Miss Universe? Did you get to make up your own questions? I was a big fan of Miss USA, but a lot of people were concerned that she was too skinny. I believe it is just her DNA, just the way she is, but a lot of people weren’t buying it. I think it hurt her chances. 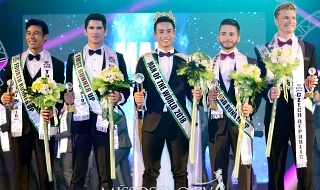 Of the five top finalists, I had picked out three: Miss China, Miss Philippines, and Miss Brazil. Before the show ended, you were posting on Facebook about how much you liked the eventual winner, Miss Angola. What did your wife, Heidi, think of you hanging out with all these babes? I am married to my own Miss Universe who supports me in everything I do, she loved the idea of me going to meet these “babes” because I am simply going to enlist them all in great philanthropic endeavors! See also: Supermodel Speaks: Sports Illustrated Cover Model Irina Shayk. Kiri Blakeley writes about women, pop culture, and media. Follow me on Twitter. Follow Scott on Twitter @scottlazerson. I found Miss Angola to be very bland and she didn’t stand out to me at all (Miss Philippines with that amazing walk and presence certainly did), but according to another judge in that edition (Broadway icon Lea Salonga), Miss Angola won the judges over on finals night (she picked the two as her top choices as well). I REMEMBER, LEILA LOPES AND SCHERRI LEE BIGGS BET TO WIN (ASIDE FROM THEMSELVES) WAS SHAMCEY. 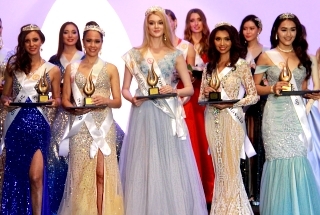 IMO, THIRD RUNNER-UP WAS TOO LOW FOR HER.